Frequent customer requests for Combustible Dust testing include questions regarding the collection and shipment of the dust to be tested. It can seem daunting to collect the sample(s) most representative of your facility and then ship it to a test facility. In Prof. Paul Amyotte's "An Introduction to Dust Explosions: Understanding the Myths and Realities of Dust Explosions For a Safer Workplace," Amyotte offers a section on Practical Guidance. I tell my plant manager to write their name on their business card. It's time to clean up when they can't read their name because of layered dust. (Anonymous, 2012. 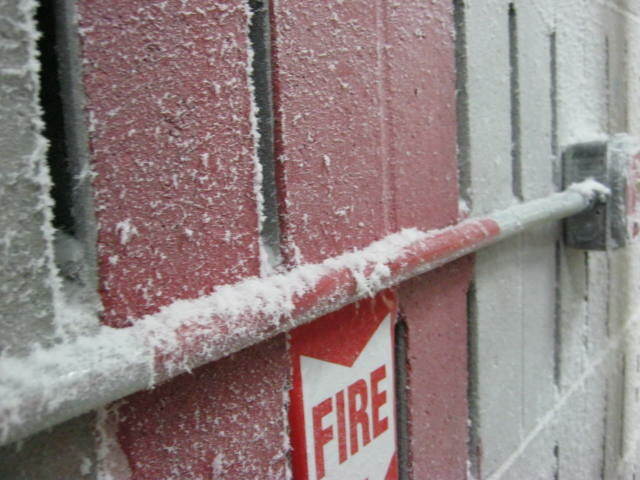 Personal communication, with permission)"
What is a combustible dust? Some of these materials are not "normally" combustible, but they can burn or explode if the particles are the right size and in the right concentration. Therefore any activity that creates dust should be investigated to see if there is a risk of that dust being combustible. Dust can collect on surfaces such as rafters, roofs, suspended ceilings, ducts, crevices, dust collectors, and other equipment. When the dust is disturbed and under certain circumstances, there is the potential for a serious explosion to occur. The build-up of even a very small amount of dust can cause serious damage. What is the technical definition for combustible dust? The technical definitions for combustible dust vary. In Canada, one example is Alberta’s Occupational Health and Safety Code which defines combustible dust as "a dust that can create an explosive atmosphere when it is suspended in air in ignitable concentrations". The Occupational Safety and Health Administration (OSHA) in the United States defines combustible dust as "a solid material composed of distinct particles or pieces, regardless of size, shape, or chemical composition, which presents a fire or deflagration hazard when suspended in air or some other oxidizing medium over a range of concentrations. What workplaces are at risk for a dust explosion? Dusts are created when materials are transported, handled, processed, polished, ground and shaped. Dusts are also created by abrasive blasting, cutting, crushing, mixing, sifting or screening dry materials. The buildup of dried residue from the processing of wet materials can also generate dusts. Essentially, any workplace that generates dust is potentially at risk." So, have something that might be hazardous in your facility? You need a simple test to find out if its explosible. That's a "Go/No-Go Test". Collect a dust sample and find out if and what it takes to ignite. Air sampling is not necessary to determine whether or not a dust is combustible. 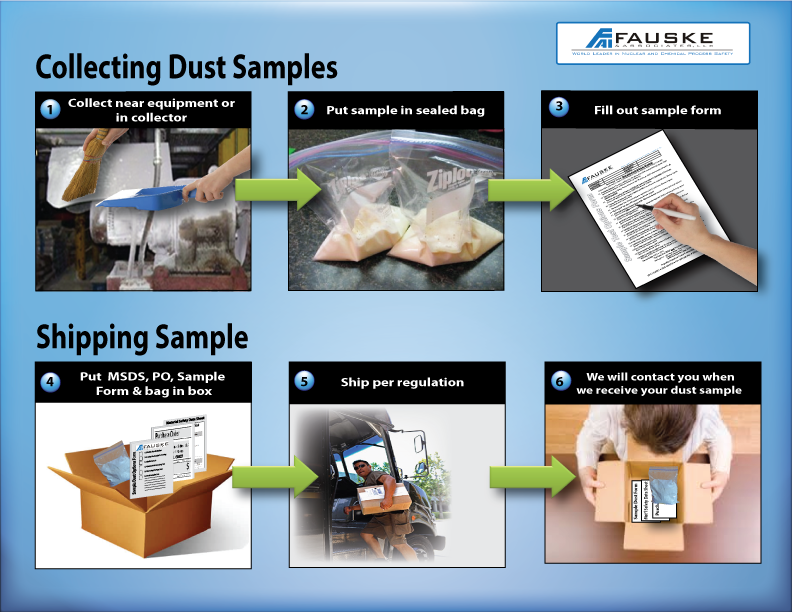 Dust testing is performed on the sample as it is received (“as received”) from your facility. It may be screened to less than 420 μm (40 mesh) – OSHA’s and NFPA’s demarcation of a “dust” – to facilitate dispersion into a dust cloud. Particle size may vary widely depending on the sample. ** Please note: If you suspect you may have an electrostatically charged dust, collect the sample by using a plastic coated shovel or scoop. A Go/No-Go Screening Test, based on ASTM E1226, “Standard Test Method for Explosibility of Dust Clouds”, is an abbreviated set explosion severity testing at two or more dust concentrations to determine if the sample is explosible. This test is generally performed with samples tested ‘as received’ or sieved with >100 grams (~¼ lb) of sample less than 420μm required. It's that easy. If you would like to know more about all available tests or have further questions, please contact Jeff Griffin, griffin@fauske.com, 630-887-5278, www.fauske.com.